Today, after dropping off donations at my local Goodwill, I wandered inside to see what treasures I could find. I love looking, but am never super optimistic. I mean, let’s face it, thrift-store stuff is the detritus of people’s lives. The castoffs. The stuff that doesn’t get sold at yard sales or given to family and friends. My first port of call … the book shelves. I found two vintage books on needlepoint design that will make a great set. Not a huge money maker, but still nice. Then I headed to the “art” area. Yes, it’s “art” in quotes because usually it’s generic posters and a few cheap frames. Today there was a nice oil painting of a 1940s/50s-era woman for $36 which I didn’t buy because it was so large (but I wish I had…she was rather lovely…maybe I’ll go back for her!) and a numbered print for $19 that according to the price tag was just put out today. 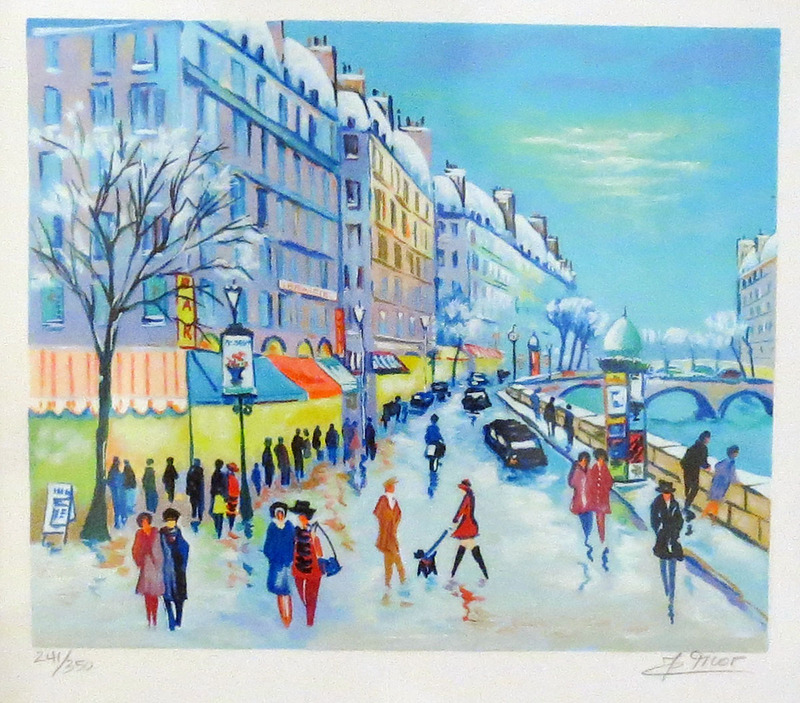 I’m clueless about art, but I liked this print and thought, “Hey, it’s numbered, signed, in a nice wood frame. 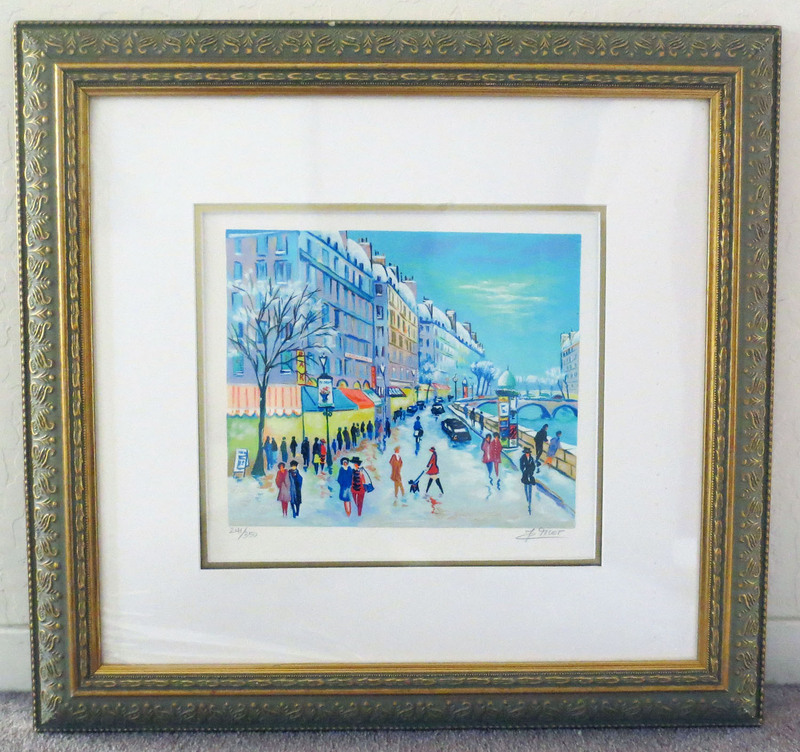 The frame alone is worth the money!” I was happy to buy it. I haven’t found a more current valuation for this print. (Still working on that.) But I’m hoping to get between $300-$400. So sweet to have a bit of good luck at Goodwill. Doesn’t happen often. And I’m going enjoy this print till it sells. It’s rather enchanting. How about you? Any good finds lately? The art print is just lovely. But I’m afraid I disagree with your negative assessment of thrift shops as carrying only “detritus” and “cast-offs”. Many people choose to donate good items not being worn or used any longer so that others can benefit. And what we used to call hand-me-downs can be of good quality even though slightly worn or sometimes not worn at all. I love that print–so pretty and great colors. Wonderful find for Goodwill. I hardly ever go into the Goodwill shops around here because I rarely find anything and when I do, it’s too much money. My husband and I went to a flea market recently and I found two vintage brass front drawers from a post office cabinet. I love them and decided to use them in my booths as props only–can’t bring myself to sell them yet!